Papermaking dates back to ancient Egypt, where a thin paper substance called papyrus was made from plant materials. Today, you can still make your own thin paper with torn bits of paper. The process is less labor intensive than making papyrus and can be an entertaining afternoon project for the entire family. Modern papermaking uses shredded pieces of paper to create a pulp for the new pieces of paper. The thickness of the old paper you use will determine the thickness of the new paper you make. For thinner paper, you can use newsprint. Newsprint will give your paper a grey tint. Typing paper will produce a thin, white paper. Tissue paper makes an ideal thin paper. 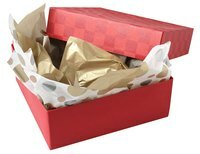 Collect used and crumpled tissue paper used in crafts or gift wrapping. Flatten and smooth the tissue paper before ripping the paper into 1-inch pieces. Making thin paper at home requires specific tools. Most of the tools can be found around the house, and the few you may need to purchase can be found at a home improvement store. A large plastic tub is needed. Select your tub first so you will know how large you can make your deckle frame. A deckle frame collects the paper fibers from the water on a screen. The entire frame will need to fit into the tub. To make a deckle screen, you will need some fine window screening, a hammer, tack nails and an old picture frame. Cover the back of the frame with the screening. Pull it as taught as possible and tack it in place with the nails. You will also need a blender, a sponge, pieces of flannel fabric and a rolling pin. Prepare the paper you are using by tearing it into 1-inch pieces. Place the paper into the blender. Fill the blender with equal parts paper and water. Blend the paper until you no longer see any defined pieces of paper and the mixture has a soup-like consistency. Fill the plastic tub halfway with water. Pour the contents of the blender into the tub. Submerge your deckle frame in the tub. Paper fibers will collect on the screen. Move the frame slowly underwater to evenly collect paper fibers. Lift the frame out of the tub while keeping it level. Press the sponge onto the screen to squeeze out excess water. When the screen is no longer dripping water, flip the frame over onto a piece of flannel so the paper falls flat on the fabric. Lift the frame slowly away from the fabric. Repeat the process and stack the pieces of flannel on top of each other. Once all of the pieces are finished, place a dry flannel square on top of the stack. Roll the stack with a rolling pin to release more water. Separate the flannels and let the paper dry. Peel the paper from the fabric when dry. You can make your thin paper unique by adding textures and colors to it. For colored thin paper, use colored tissue paper or mix a decorative color in with white tissue paper. Plain tissue paper can be colored by adding food coloring to the blender before mixing the pulp. Add texture to your paper by mixing a small amount of construction paper with the tissue paper. You can add pieces of dried grass or dried flowers to enhance your thin paper. Add the decorative elements like grass, flowers, glitter, thread or dried spices to the plastic bin before placing your frame in the water.